Town attacker Elliot Lee felt his side ‘outclassed’ Wycombe Wanderers in their FA Cup first round 2-0 win on Saturday. The hosts were by far the better side on the day, with Andrew Shinnie and Harry Cornick on target to set up a second round tie with Bury. We were better all over the pitch and that’s why we got the win. It’s a great win for the boys, I thought we were always in control. Lee, who picked up the sponsors man of the match award on the day, said: “It was really enjoyable, a bit frustrating in the first half and some points in the second half, but it was an enjoyable game in the end. “I thought we outclassed them in every area of the pitch eventually, a great win and on to the next round. “I enjoy playing Wycombe at the Kenny, I’ve had a few good games in the past and another one today. “We sort of knew what they were going to come and do, they were going to match us up in the diamond, all credit to us, we were better in the diamond. Lee was back at the tip of the diamond once more, in support of both James Collins and Cornick, as he was instrumental in the hosts’ performance. He continued: “I’ve said in the past, it’s another string to my bow. Team-mate Harry Cornick was quick to praise close friend Lee’s display, saying: “He had a really good game, he was unlucky not to get a goal, but it was nice to play with him. “We get on well off the pitch, so it was nice to get on the pitch and have some fun. “We always have a good game with them (Wycombe), they always make us battle hard. In the first 20, 30 minutes, it was more of a battle than a football match, the ball was out of play a lot and we didn’t really get it down. 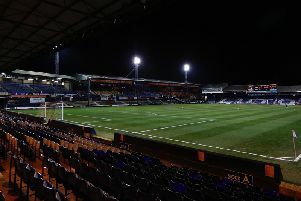 Lee was also pleased to see Luton impressing at the other end, as centre halves Matty Pearson and Sonny Bradley ensured Town kept a third successive clean sheet. He said: “They’ve been fantastic all season and we’ve got another two centre backs in Sheezy (Alan Sheehan) and Lloyd (Jones) behind them. Meanwhile, boss Nathan Jones added: “We want to do that as we know that we’re good enough to get a goal most games, if not all games.